The app is getting a full redesign: since you control both Nest Protect and the Nest Learning Thermostat from one place, we updated the mobile app to fit-and work better-for both. 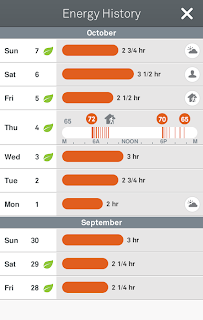 You won't have to turn the phone sideways to set your Thermostat to Away or view settings and things will get a lot more interesting when you connect a Nest Protect. Web control from nest.com has been redesigned to match. We've also improved several heating features on the Nest Thermostat to help you save energy this winter. 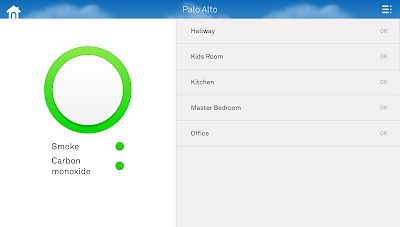 The interface of the app has been updated to give users all the information they need at a quick glance, including weather, the ability to change a user's status from "home" to "away" without putting the phone into landscape mode, a dynamic Nest thermostat icon and a dynamic Nest Protect icon. The Thermostat icon turns black if a room is cooling or isn't heating and will turn orange if it's heating and blue if the AC is on. The Protect icon is green if everything in the home is OK and will turn yellow or red if there's a Heads Up or Emergency Alarm notification respectively. The 4.0 update is being pushed to Thermostats automatically over the next couple of days. Nest notes that users should check "Technical Info" within "Settings" to see if their Thermostat has received the update. The app update is available now.